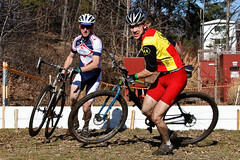 Proteus Bikes’ Cross My Heart CX and Superbowl of Singlespeed went down February 1. 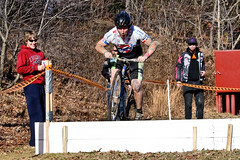 The grounds of Cherry Hill RV Park saw their first ever cyclocross event and a great day of racing. How many times do you get to race a muddy course with patches of ice on a sixty degree day? That, my friends, you cannot beat. The addition of the singlespeed race brought out a more diverse crowd than your normal CX fare. That is a field that knows how to enjoy themselves during a race. The post-season vibe and incredible weather made the day a little more laid back than usual and a whole lot of fun. For this event I broke the interviews into three parts. First off, we have the Superbowl of Singlespeed podium. In part two we will hear from the top finishers in the Cross My Heart race. And in part three, we are going to hear from some CX first-timers. Did you race earlier in the day? 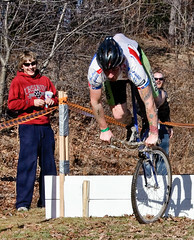 RANDY ROOT (Evolution Cycling Club), First Place: No. THOMAS MACKAY (Family Bike Shop), Second Place: I was signed up for the B race, but I’d been really sick for the past week or so and decided to bag it. Looking back I feel I coulda done it, but I made the right choice. 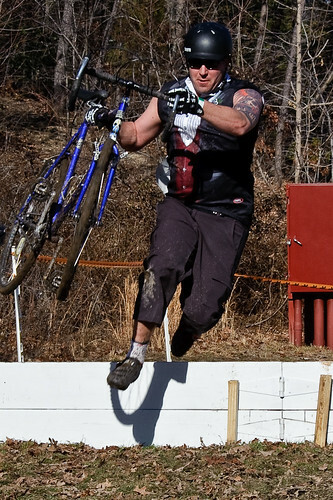 JONATHAN SEIBOLD (Family Bike Shop/DCMTB), Third Place: No. THOMAS MACKAY: Redline Monocog flight 29er BABY!! (MTB) 30lbs!! JONATHAN SEIBOLD: Yes they were delicious. That was all. RANDY ROOT: yes I did, I think they were butterscotch! egg burrito! THOMAS MACKAY: Actually I missed them, bummer…. I pretty much just ate pasta at home for lunch and some Hammer gel. RANDY ROOT: haha. Sent the promoter an email and guilted him into working on the course. THOMAS MACKAY: Broke out the fat tire bike and put away the long sleeves. GREAT WEATHER, my gosh. JONATHAN SEIBOLD: Lowered the air pressure a bit and rode. Did you dismount for the barrier? If so, why? RANDY ROOT: Of course. It’s cx. 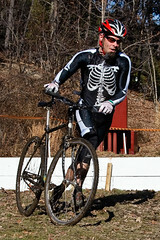 I watched the mtb guy [Tom Mackay] endo in front of me on the first lap! JONATHAN SEIBOLD: Yes. Didn’t feel like stacking it. THOMAS MACKAY: I flew into the barrier on the first lap. I had a huge adrenaline rush and the noise of the crowd only hyped me up more. Being on an mtb, I thought I could clear it. I didn’t. I lost 1st place. I’m still limping. What was the most challenging part of the course? What feature could you have done without? RANDY ROOT: The descent to the wooden bridge. The wooden bridge. JONATHAN SEIBOLD: The wood chip trail. Liked all the features. THOMAS MACKAY: The long straights by the lake that were complete mud just got to you mentally, they are by far the most challenging. The rest of the course was very good. Describe the decisive move of the day. RANDY ROOT: There were lots of guys gunning for the first turn. Let whoever wanted to go, but at the mudbog after the first turn, big crash and it was two of us after that. THOMAS MACKAY: Phew…. 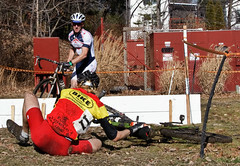 Root attacked me after I ate it on the first lap and gapped me. That’s all she wrote. JONATHAN SEIBOLD: Randy Root and Tom Mackay getting great starts. Me taking out the rest of the group at the first run-up. Did you get heckled by any fans? If so, what did they say? THOMAS MACKAY: The fans were great!! They wanted me to try bunny hopping again, but I wanted to stay in second. RANDY ROOT: No, lots of cool applause. JONATHAN SEIBOLD: My kids yelling go Daddy! That’s always cool. RANDY ROOT: yes, arrows on the road and a few signs, one that said “spay your cat.” Or “pet “I dunno for sure. JONATHAN SEIBOLD: Yes. The smile sign made me smile. Laugh actually. THOMAS MACKAY: SAVE FOR YOUR RETIREMENT!!! How was this race different then your normal race day? THOMAS MACKAY: Afternoon race, partied afterward!! Showers were such a convenience. RANDY ROOT: First single speed race. I had no idea how to pick a gear. JONATHAN SEIBOLD: Kinda just went and rode. Didn’t really warm-up or anything. JONATHAN SEIBOLD: My friend Ryan racing for the first time ever wearing jeans and a t-shirt. Tom eating it going over the barriers and then riding through the pit with Randy following because he didn’t know the course. 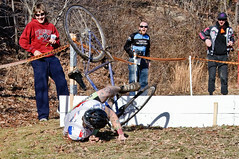 (I didn’t see this except for pictures) On the first lap some guy crashed in the first mud pit. That was funny. RANDY ROOT: It was all fun because it was out of season, no points to chase. THOMAS MACKAY: Felt and Jamis reps were present. I want to see you guys out there more JOE AND ROB!!! RANDY ROOT: A shout out to the promoter and club Proteus. They did a great job. It was a good venue and hope they do it again, maybe in the fall season too! THOMAS MACKAY: RYAN STOUTEN!!! First race ever!! 15th in SS. JONATHAN SEIBOLD: Awesome race Proteus. Hope you can have it next year. That fork looked sweet. I wish I could have won it. ... oooh, a bit low and outside. Props to ya, Ry. Man that was a fun race to watch. 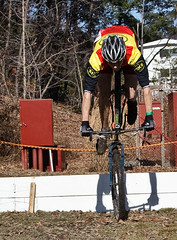 I did not know anyone got the awesome display of riding over the barrier by Tom. I went over to cheer him to go over it again but he chickened out. As a Roadie I wanted to give it a try.